As a national thought leader on strategic thinking, Rich has appeared on ABC, NBC, and FOX TV to discuss current topics in the world of business strategy. Media outlets around the world including CNN, CNBC, FOX Business, Investor’s Business Daily, Reuters, the San Francisco Chronicle and Chicago Tribune have featured Rich and his perspectives on current business issues. With his engaging and insightful take on the keys to a leader’s business success, Rich has appeared on radio stations from New York and Boston across the country to Los Angeles. 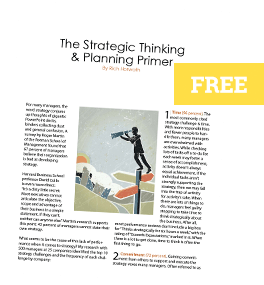 The brochures feature a brief overview of the services Rich provides to help leaders increase profits and competitive advantage through strategic thinking.